LEC, 2015, organised by OLEM EDGE GLOBAL CONCEPT, is hereby presented – holding on May 30, 2015, at FGC Omole, 1-7, Titilayo Adedoyin Street, Omole Estate, Phase 1, Ikeja, Lagos. The certificate of recommendation warrants the receiver to use OLEM EDGE GLOBAL CONCEPT as Referee, as well as, using the certificate as additional document in Job CV, with sponsors’ attestation. This certificate can only be gotten after a participant of Leadership Ethics Conference has passed through several (thorough) tests – with test on his/her integrity, and only the 1st Twenty Participants (from 1st to 20th positions in the last–round test) are eligible for the certificate. are picked would be written test based on the conference presentations, magazine publication (in our blog site), the book published (leadership ethics), and Current Affairs. Ø To create the interest to always work towards the peace and unity of the country and the vicinity of participants – in the participants. Ø To create the sense of social responsibility in the participants. Ø To motivate participants on reducing social vices. Ø To inculcate human communication (relationship) in the participants. Ø To create the spirit of self-sacrifice (to bring positive changes to the society) in the participants. Ø To enlighten participants on the power of integrity. To motivate participants on educational pursuit with the aim that after graduation, they have tangible document (certificate) to attach to their CVs. To encourage beneficiaries to live a life of integrity and accountability, knowing that any mis-representation of OLEM EDGE GLOBAL CONCEPT amounts to withdrawal of the certificate, permanently. To support those who may be looking for jobs but need standard referee for their cover letters. To project the image of our sponsor before the general public as supporting moral values. To work with our sponsor without any charges in getting qualified candidates for available positions, among the receivers of certificate of recommendation. 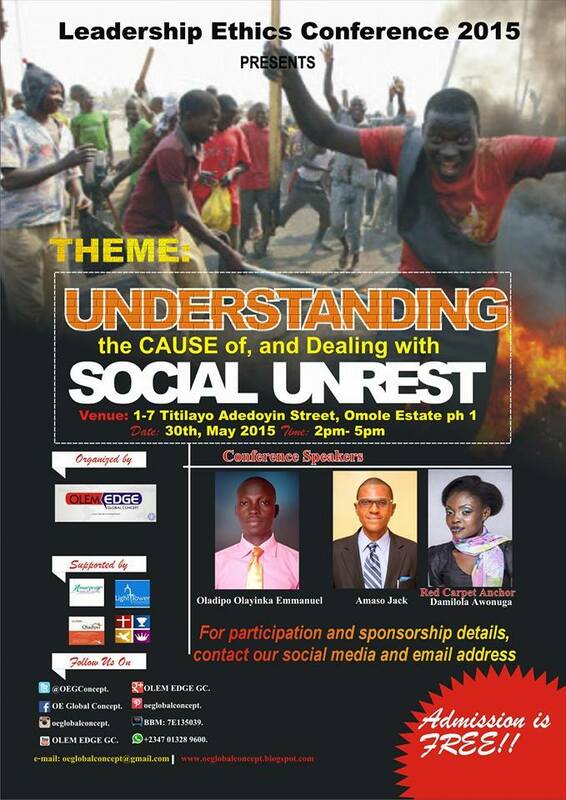 1.THEME: understanding the causes of and dealing with social unrest. 2. DATE: 30th May, 2015. 3. TIME: 2pm – 5pm. 4.VENUE: 1-7, Titilayo Adedoyin Street, Omole Estate, Phase 1, Ikeja-Lagos, Nigeria. 5. SPEAKERS: Oladipo Emmanuel, and Amasokaizer Jack. 6. RED CARPET: anchored by Damilola Awonuga (starting at 2pm, prompt).